1. 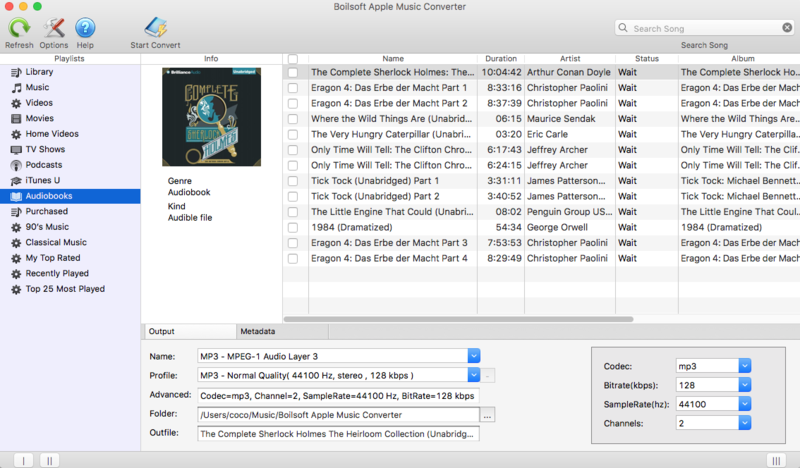 Download and install Boilsoft Apple Music Converter on your Mac/Windows. Run it and below window will appear. All your iTunes files will be shown automatically on the interface, including music, movies, TV show, audiobooks, etc. Click Audiobooks on the left column and you will see all your Audiobooks on the right side. 2. Select Audiobook you want to remove DRM from. Click the checkbox before the Audiobook you want to remove DRM from. 3. Start to strip Audiobook DRM protection. Before starting conversion, you can select the output format, customize output file profile, choose output folder. Click “ Start Convert” on the top to start removing DRM from audiobooks. It only takes few minutes to remove DRM from audiobooks. After the Conversion, you can enjoy your audiobooks anywhere on any devices, and you can also share your audiobooks with your friends without limits. Useful Tips: Movies and TV shows purchased from iTunes Store are also DRM-protected. If you want to remove DRM from iTunes movies and TV shows and convert them to MP4, try this iTunes Video DRM removal software - iTunes DRM Media Converter.